The government has been ordered to face a judicial review for failing to protect people’s health from harmful levels of air pollution in towns and cities. 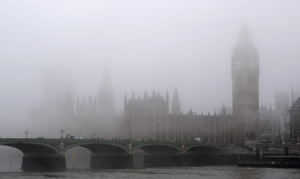 The government has been ordered to face a judicial review for failing to protect people’s health from harmful levels of air pollution in towns and cities. The ruling, that environment secretary Caroline Spelman face the High Court later this year, follows green group Client Earth’s legal challenge. Twenty nine thousand people die prematurely every year because of air pollution – more than die, or sustain serious injuries, in road accidents. The review is a legal challenge to Spelman’s failure to produce plans that will bring nitrogen dioxide within legal limits by 2015, and her refusal to consult the public on her latest plan for reducing dangerous airborne particles in London. “They have devoted years to finding loopholes to avoid meeting their legal responsibilities, time that could have been spent protecting people. This afternoon’s developments are but the latest in a long line of blows to David Cameron’s claim this would be “the greenest government ever”. Only yesterday, a Green Alliance audit concluded the government had made little to no progress on more than 75 per cent of its green promises because of obstruction by the Treasury and business departments and a lack of public backing from the prime minister.